Full kitchen, wood burning fireplace in living room, master bedroom has king size bed, second bedroom has 2 twins. Sofa bed in living room. 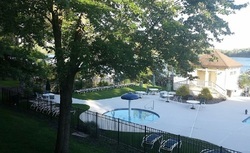 Overlooks and steps away from pool, jacuzzi and kid's pool ( Opened Memorial Day through Labor Day). Beautiful view of lake from living room and dining area. 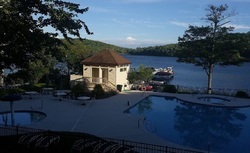 Mountain Lake Club has nice beach area, another pool, small boating, fishing. For skiers in winter, slopes are just a 2 minute drive (approx. 1/2 mile), or 10 minute walk. The unit has everything you need on vacation. Central air, heat, a fireplace with firewood that is available in front of the building at no additional fee.